Robert Brady began his prominent career in design over 20 years ago with the Cigarette Racing Team in Miami. By 1990 he had founded ROBRADY design. Today, he leads all product design, strategy, implementation and business development of the Sarasota, Florida-based firm. ROBRADY design is globally recognized as a design leader in the transportation, consumer/electronics, industrial, medical, graphic/interactive, and marine markets. He also co-founded and currently serves as Executive Director of ARMORIT—a product design, development and delivery consortium aimed at Military and Government markets. 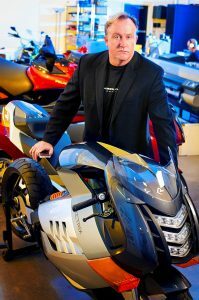 Brady’s expertise and vision have shaped revolutionary and award-winning products such as the Vectrix electric Superbike and VX-1 maxi-scooter, the Segway, the GMP LifeSync wireless electro-cardiogram system and personal watercraft and jet boats for Yamaha and Polaris. His portfolio also includes motorcycles, all-terrain vehicles, digital instruments, lightweight composite tools, surgical devices, exercise equipment, fuel cell devices, jet and recreational boats and off-shore high performance powerboats. His studio delivers its multinational client base—including General Electric, Mercedes‐Benz, Office Depot, Parker Hannifin, AT&T, Textron, Caterpillar, Merial and Segway—progressive industrial design, mechanical design and engineering, graphics /packaging / GUI / web and eCommerce design, market research, brand and retail development, complete rapid prototyping and production program management. ROBRADY design stresses comprehensive speed‐to‐market product solutions from start-up to Fortune 100 by collaborating to identify the greatest areas of opportunity, producing innovative designs that deliver profitable results.